Lilac Street was a good place to be this past weekend. Newhallville residents, Yale students and professors, interested homebuyers, New Haven art enthusiasts, local policemen, and NHS staff and board members were all gathered at 32 Lilac Street to celebrate its Open House event. NHS collaborated with senior undergraduate architecture student, Justine Yan of Yale University, who had an interest in finding the answers to an intriguing set of questions, “If I give an artist a bedroom, how will she fill that room? If I give an artist a bathroom, how will she fill that room? Kitchen, basement, hallway?” And so, nine artists - Rebecca Aston, Zachary Bell, Martina Crouch, Elif Erez, Kenta Koga, Jacqueline Lee, Anna Renken, Olivia Schwob, and Jaime Sunwoo - joined NHS staff in presenting the newly-finished, Energy Star-certified house to the public. Performance art in the basement. Concrete sculptures lined the hallway. Performance art interacting with open house visitors. Students were pleased with the opportunity to develop their artistic talents, potential homebuyers were pleased with the beauty and affordability of the house, NHS was pleased with the opportunity for resident engagement, and all were pleased with the music performed by local DJ, DJ Toot Skee. Event participants were fortunate to hear him and other musicians both Friday and Sunday, as part of the Newhallville.Community.Matters sponsored resident appreciation street party on Lilac Street on Sunday. The Lilac Street Block Party! A big thank you to all who participated and came out to this fun and unique event! To read the New Haven Independent's coverage of the Open House, click here; and click here to read about the block party on April 27. To create a beautiful place that encourages a positive and active attitude among its residents and visitors in the area known as the West River neighborhood. Stacy opened the evening’s course with the ice breaker “Two Truths and a Lie,” where each participant shared three statements about themselves, two of which are true and one is (you guessed it!) a lie. 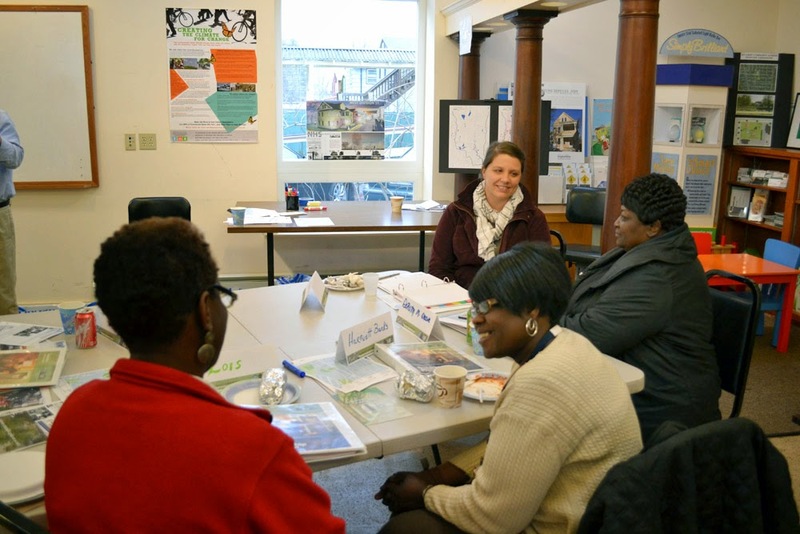 This afforded participants the opportunity to continue to learn more about others invested in the New Haven community, and of course garnered quite a few laughs in the process. Building off the energy the ice breaker brought to the room, Stacy then encouraged all participants to share with the group what words they think of when they hear the word “power.” Words and phrases like “influence,” “authority,” “ability to create change,” “catalyst,” “control,” quickly buzzed from all sides of the room. 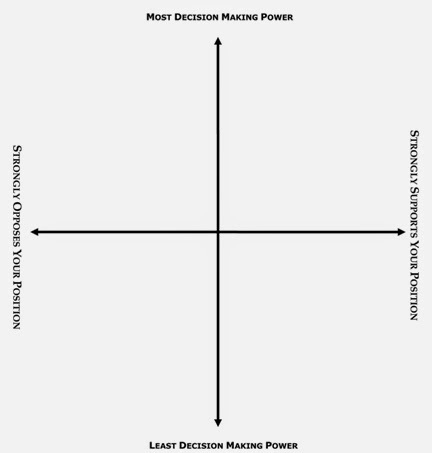 The provision of the definition led to a discussion on the concept of “power mapping,” an activity which the group then participated in. Participants divided into groups based on neighborhoods, used an existing scenario in their community or created one, and mapped the power related to solving the problem on the power mapping axis. Once everyone had finished, each group chose a spokesperson who explained the problem, the solution, and all the factors of power related to them. Stacy concluded the evening by reminding everyone that they have the ability to create change in their communities and stressed the importance of getting out there, taking the initiative, and getting things done. He also encouraged participants to look up their residing alderpersons, LCI specialists, police chiefs, and other local officials if they did not already know who they were. 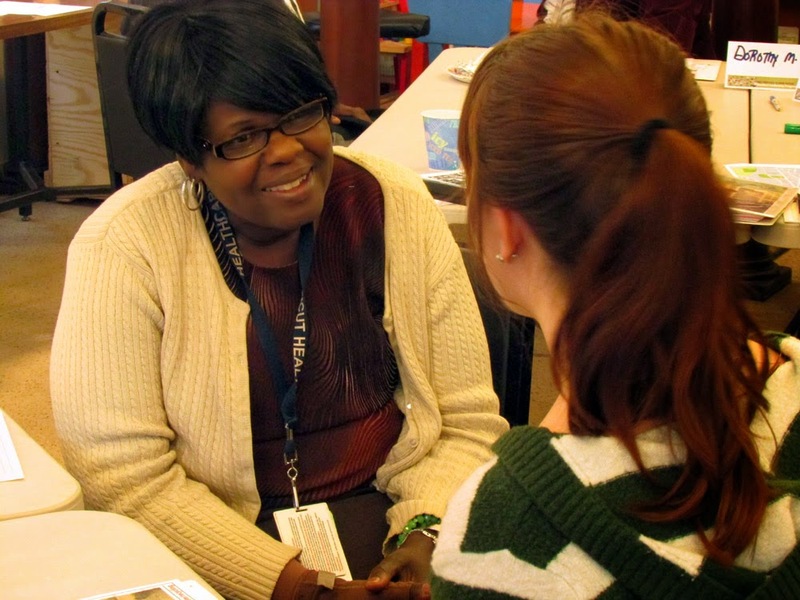 Participants felt recharged and more confident than ever in their ability to get things done! Last week in the Home Improvement and Energy Conservation Lab, Ron Wheeler and Tom Engelhardt of World Gutter Systems taught a group of contractors how to install a gutter system that is the sturdiest, longest lasting system we have encountered yet. Durable materials are part of the recipe for sustainability in NHS’ housing rehabilitations. Most of the houses rehabbed by our Design and Construction Department are about 100 years old, and we want them to last another 100 years. For more information on upcoming Lab Classes, look here! 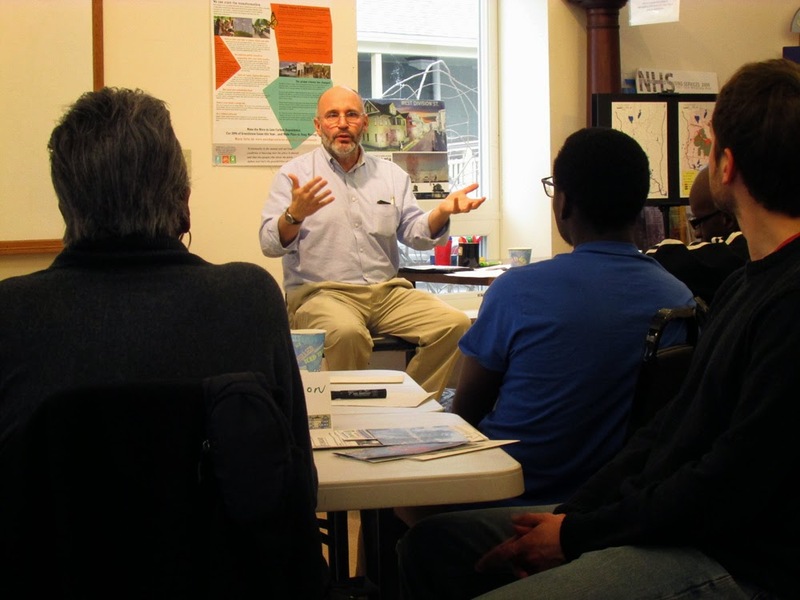 Last Tuesday evening, we kicked off our second Resident Leadership class with Lee Cruz, Community Outreach Director at the Community Foundation for Greater New Haven. Lee led us in a discussion of “Mapping Community Assets”. Participants engaged in a series of discussions and activities centered on leveraging community resources and forging lasting connections. The group discussed strategies for effectively combating the negativity that often dominates discussions of New Haven’s neighborhoods. Lee guided participants in identifying what steps neighborhood residents can take to transform perceptions and highlight the positive features of our communities. He emphasized the importance of avoiding the temptation to dwell on negativity, and instead to counteract negativity by “overstating the positive”. Participants spoke in small groups about what motivates them personally, and how they can begin to use these ideas to motivate others. These discussions were used to help inform community organizing strategies and provide inspiration for resident-led initiatives. Lee emphasized the power of rituals, and how that plays into effective community organizing. Once an activity is established as a routine and people being to expect and rely on those activities, it can be a powerful tool to unite a community. For example, if a group establishes regular street clean-ups in a particular neighborhood, residents will soon begin to anticipate street clean-ups and accept them as a part of life in their neighborhood. 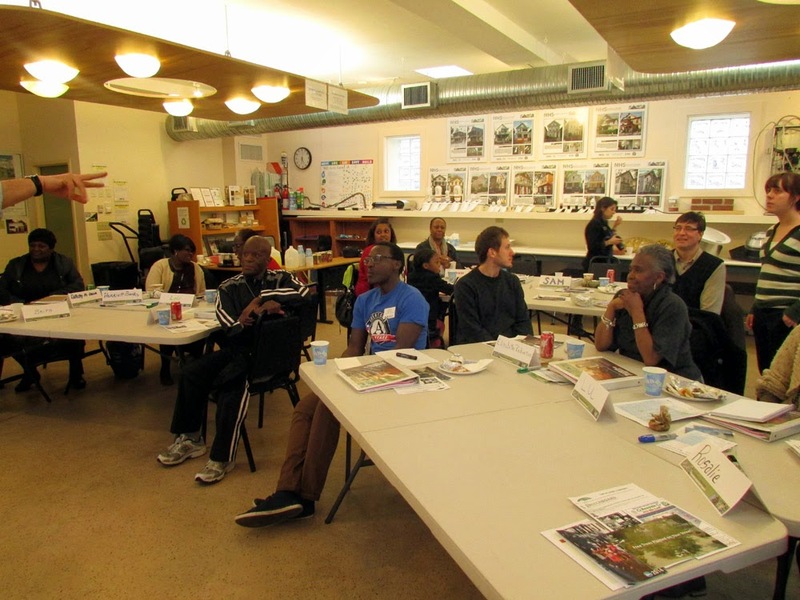 Lee suggested that participants view the clean-ups as “a means to an end”, meaning that in the process of organizing and leading these activities neighbors will connect, share, and build relationships with each other, which ultimately leads to an interconnected, healthy neighborhood. These interactions and connections are key to successful community building, and can be surprisingly easy to initiate. Lee also pointed out that taking notice of the little efforts that our neighbors make, such as a new plant or decoration, we can take comfort in knowing that pride of place exists and express that to our neighbors. To make big improvements, we must acknowledge the small steps and opportunities that happen along the way. Last Monday, we gathered at Lincoln-Bassett Elementary School to celebrate the second annual Mayors Day of Recognition for National Service. This day was observed by mayors throughout the country, and is aimed toward celebrating the profound and lasting impact of community service. Speakers, including Mayor Toni Harp, emphasized the importance of public service, especially in difficult economic times, and the vast improvement New Haven has made in recent years because of it. A group of students from Lincoln-Bassett Elementary School displayed their incredible artwork on stage - paintings that will become part of a community art project in Newhallville. NHS' AmeriCorps VISTAs Kim Ochilo and Kimberly Langin, who are members of our Community Building & Organizing Team, welcomed guests. Students in Mr. Pavano’s 5th and 6th grade art class displayed their beautiful artwork throughout the building. These pieces are going to be implemented in to a community service project utilizing a wall of an abandoned building on Shelton Avenue. 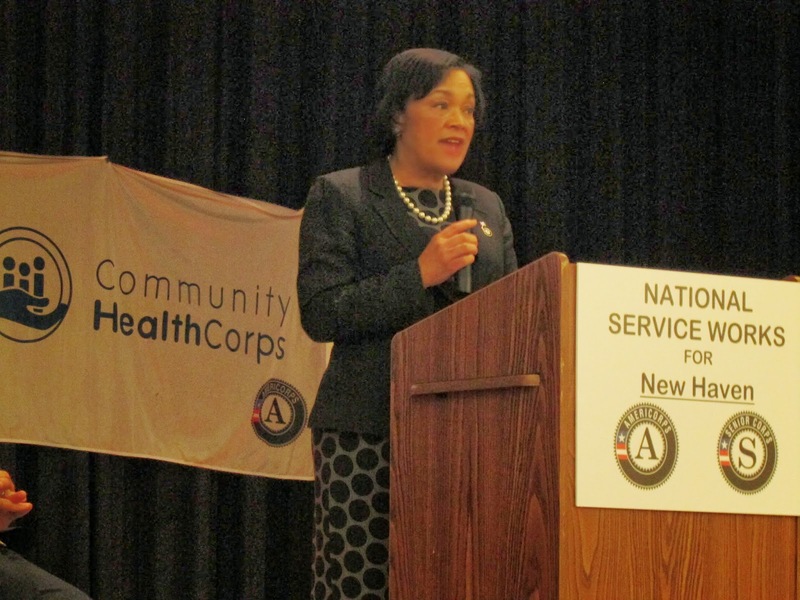 Mayor Toni Harp, a former AmeriCorps VISTA, spoke about the incredible impact that volunteers have made in our community. Our Executive Director, Jim Paley, speaks at the event. NHS has been a proud host to the VISTA program for the past 5 years. Guests included VISTA hosts from throughout the New Haven community, Public Allies, PAVE New Haven, Lincoln-Bassett Students, and neighborhood residents. 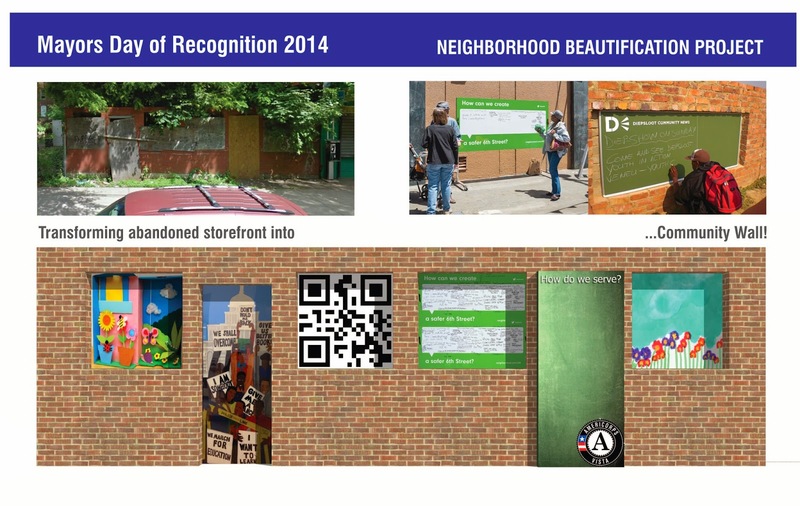 Our Community Building & Organizing team developed this rendering for the Mayors Day community service project. We're excited to see the final product! Our AmeriCorps VISTAs, Kim Ochilo and Kimberly Langin, worked with Lincoln-Bassett students to beautify the wall on Shelton Avenue. Another painting from Mr. Pavano's 5th and 6th graders. We were thrilled to work with such a talented and dedicated group! NHS is one of the many organizations participating in the Healthy City/Healthy Climate Challenge. One area to which we have been paying particularly close attention is purchasing. By taking a closer look at the products we purchase and the vendors we utilize, we have found some ways in which we can change our habits while helping out both the environment and the local economy. A purchasing committee made up of Green Team staff members Areta Huckaby, Becky Skau, and Colleen Trompeter, Board representative Celeste Suggs, and AmeriCorps Green VISTA Member Allison Kelly went through our office supplies, checking each product to see if it was an environmentally-friendly product. Surprisingly, many of our products were not as good for the environment as we thought! We learned a lot about greenwashing, which occurs when companies attempt to brand their product as “green” and “natural” without actually meeting any certification requirements. The purchasing committee was a tad daunted at first. We needed to research alternative products that would better suit our sustainability goals. However, after reading just a few articles about the toxins and carcinogens in our current cleaning products, the committee decided to start by finding cleaning agents that would be better for the environment and for our staff! Once we decided to switch our cleaning products, we were much more open to switching over other types of products. The NHS "Green Team" meets monthly to discuss how to make our operations more sustainable. Paper was next. We were looking for paper products, from paper towels to copy paper, with at least 30% post-consumer recycled content. Since we’re recycling all our paper now, we need to show the market a healthy demand for new paper made from the old. We were also pleased to have the opportunity to work more closely with local businesses. We were a little worried, for example, that our copy shop would not be able to meet our post-consumer recycled content requirements. However, they had plenty of paper choices and were happy to guide us as we transition our orders over to a more sustainable option. We did learn, though, that we cannot switch over all of our products at once, as much as we would desire it. Some products, such as 100% post-consumer recycled content copy paper, or compostable utensils, while much better for the environment, are just too costly at the present time. When we discussed this with our vendors, they agreed that products such as these are not yet as affordable as they will be in the future. We decided to revisit these product options in a few years, to see if the market has shifted and their price has dropped into a range that we can afford. However, we were also pleasantly surprised to find that several environmentally-friendly products, such as facial tissue and hand soap, were less expensive than the products we’re currently using! Buying in bulk will make each product cheaper per unit while also cutting back on packaging and transportation costs. Some products fit into multiple categories, while others satisfied just one requirement. Even small steps in the right direction, though, are reducing our impact on the environment while setting an example for other businesses. Our new purchasing guidelines are just one part of our Green Designation Application. We’re optimistic that they will help us achieve a higher degree of green consciousness and sustainability in the years to come. We hope you will follow us as we report how we’re greening other areas of our organization.